In a stunning announcement today that nobody saw coming, Canadian Natural Resources (CNRL) announced the acquisition of Shell's 60% stake in the Athabasca Oil Sands Project (AOSP) and the remainder of Shell's upstream liquids Canadian assets for US$8.5 billion. Marathon Oil has also sold their 20% stake in AOSP to both Shell and CNRL for US$2.5 billion. Once both transactions are completed, AOSP's ownership structure changes from 60/20/20 Shell/Chevron/Marathon to 70/20/10 CNRL/Chevron/Shell. CNRL will assume operation of the Muskeg River Mine north of Fort McMurray. Timelines for the transition were not disclosed. various intellectual property agreements valued at $285 million, and a long-term supply deal for the Scotford refinery. Except for a 10% stake in AOSP, Shell has effectively withdrawn from the oil sands. However, the company will remain as operator of the Scotford upgrader and adjacent Quest carbon capture facility. Shell's chemical plant and two Canadian refineries - the Scotford Refinery near Edmonton and Corunna Refinery in southern Ontario - are not included in the sale. Natural gas assets in the Duvernay and Montney region are also not affected. LEASE MAP COURTESY CDN NATURAL RESOURCES LTD. This latest round of divestitures by oil majors raises questions of whether Canada's onerous regulations is deterring global investment. Statoil recently exited the oil sands late last year, selling its leases and in-situ operations to Athabasca Oil sands for just under $600 million. In this latest transaction, Marathon Oil also completely exits the oil sands. The company will use proceeds from the sale to purchase 70,000 acres of land in the Permian and Northern Delaware basins. Marathon says its oil sands operations account for one-third of its operating costs and only 12% of production. Those numbers are unlikely to improve as new carbon taxes introduced by the federal and provincial levels of government will add several more dollars per barrel over the next few years. Both levels of government insists Canada's carbon policy should attract, not deter, investment. The recent election of Donald Trump is likely not helping either, as the new U.S. Administration works to further cut regulations, red tape and taxes, moving investment dollars south of the border. Shell says the divestiture was due to cost and its desire to pay down debt. Shell Canada CEO Michael Crothers says Alberta's oil sands are no longer a strategic fit for the company. Parent company Royal Dutch Shell recently tied its executive bonuses to meeting emissions targets. At first glance, watching major global players exit the oil sands doesn't feel like good news. However, CNRL's focus and commitment to its Canadian operations may be an overall positive for Alberta. Shell cancelled its Peace River in-situ expansion a few years back and expressed little appetite to further invest in the oil sands. In contrast, CNRL has been spending capital dollars expanding capacity at the Horizon mine, its Cold Lake in-situ operations and the new Redwater bitumen upgrader. CEO Steve Laut says the company's two mines (Horizon and Muskeg River) will likely be able to achieve costs synergies and there may be opportunities to expand both Jackpine and the Scotford upgrader. 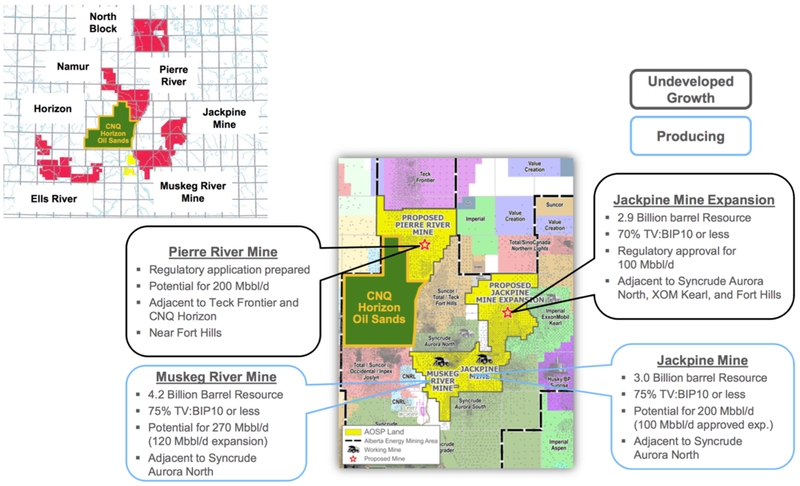 Expansions at both Jackpine and Peace River have already received regulatory approval from the Alberta Energy Regulator (AER). The acquisition also includes several oil sands leases adjacent to Horizon, potentially adding decades to Horizon's mine life. Albain Sands produces an average of 255,000 bbl/day of upgraded synthetic crude, while Peace River and Cliffdale produce about 14,600 bbl/day of heavy oil. Overall, the deal adds almost 195,000 bbl/day of net production to CNRL's bottom line. Although the company's debt load rises considerably in the near term, cash flow will also increase. Should oil prices recover from here, CNRL is well positioned for long term growth, potentially become one of the world's major players. The company also says its welcomes some 3,100 employees from Shell and Marathon into the CNRL family.